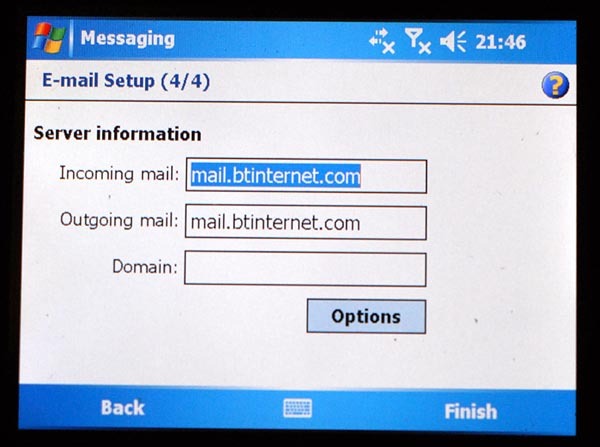 Configuring an Xda exec ( unlocked ) email. Since I use an old phone - I thought I would post this as I couldn't find it anywhere. Sort of worked it out myself. These settings work fine with both my BT and Yahoo.com email accounts. I'm using a Lebara card - but that's not relevent here. 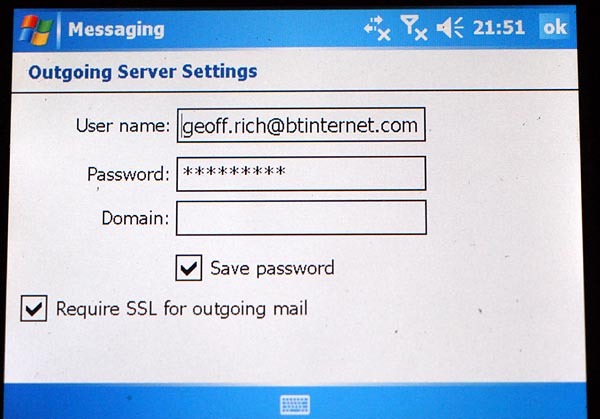 We only need the email server settings. And tick the right boxes ! If you check settings for - say - Yahoo - it will say requires SSL. ie click on BT Internet. ( the reason I have many is simple - this stupid Win 5 does not allow me to delete an account ! At least I can't find a way to do it - nuts ! When you click on an account the first of 4 screens opens. is your email name - fairly obvious. this opens 3 screens of options . First - fairly simple, leave it as here. DO NOT check the SSL 'connection' box. You need to check the Outgoing box and the Use Separate Setting box - to hightlight the Outgoing Settings options box. 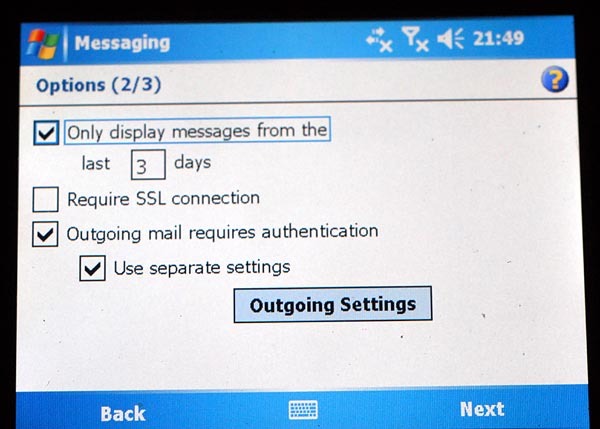 Outgoing Settings - first option - messages/3 days do as you like. then Check the bottom box requires SSL. Click finish - and to your utter amazement, your phone will now send and recieve emails ! The important one - highlighted in bold - is that first SSL connection box. Make sure you first have internet working ok. This is basically done on the settings/ connections screen from the start menu. Under 'Modem' - not network - you basically just add a new connection - name it, ie Lebara - put in the uk.lebara.mobi - then chose cellular,3g line. Make sure, if there are others already there - the Lebara one is set as default. 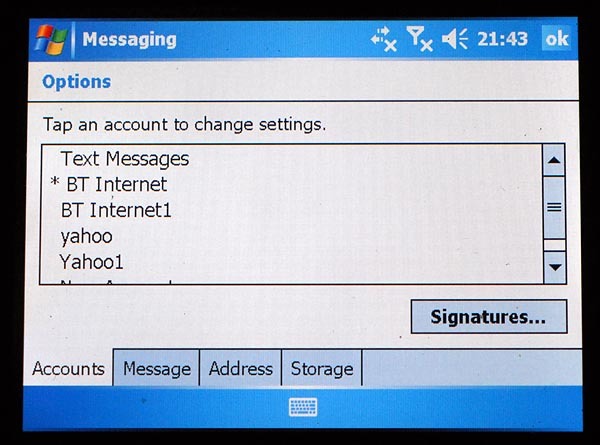 Now - under messaging, select mms - then menu/ mms configuring. Select servers - briefly select Lebara if its there - or 'new' if its not. and servers - which is the one we are after. I selected 'wap' version 2.0.
ok - and exit screen. 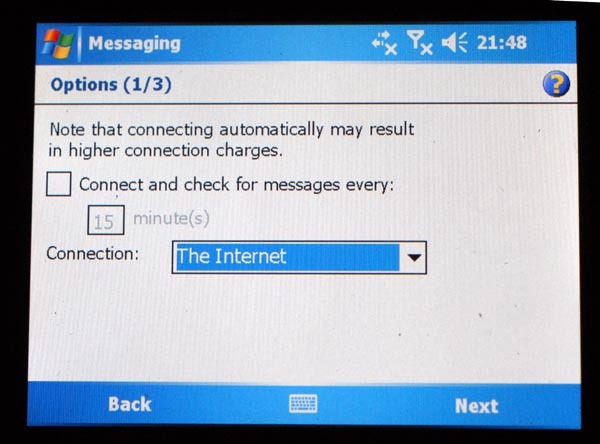 If there are other old mms headers - ie vodophone, O2 - make sure Lebara ( or whatever you called it ) is set as default. Touch and hold the screen for option - delete/default. Best keep the old settings if you go back to another sim. I've heard a load of moans over lebara, but it uses the Vodo network - and lets me allocate £5 for 30 days data at 500mb - which suits me. A simple free number shows my phone credit balance - and my remaining data allowance. Even without any data pass - it only charges 15p a mb. Vodophone, on a straight credit charges £2 as soon as you connect up ! I just use this old phone for email, weather charts/forcasts. The browser is so old that it cannot read most modern web pages. I do not need a big 30 day package - as I often do not use the phone for weeks on end if not more. I need flexibility - so on this card, I can keep credit on it with no limit - then allocate a fiver for 30 days when needed. A text will stop it recurring. I get the feeling dealing with lebara that I am actually doing business with a machine ! Its all texts - all automatic - and its cheap data. Their website has never heard of my phone ! - hence the manual settings.